Tide was on the way up. Current flow was smooth. Bait was lasting. Ah Boi was talking to us he had long time didn’t landed any biggie as he now seldom fish due to family commitment. Then…suddenly we hear reel alarm sounded…..Yes…it was ah Boi reel…He ran over to strike….we are all very excited….as recently there is many biggie manage to escape after hookup due to many reason. I determined to help him bring this one up…This time round I get my gaff ready. After some hard fight, the fish is giving way…After confirm that it was a stingray, I decide to use ah An gaff as it was bigger in size. One gaff and it was in. I decide to use another gaff to play safe to lift this heavy load up the jetty. 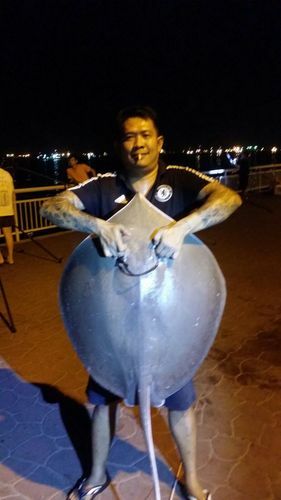 On landed, it was a long Tail brown stingray weigh 16.1kg. It is the biggest fish so far landed at jetty this year. It is also Ah Boi personal best in weight by surfcasting. The fish is later cut out to many parts and share among our friends.